The increase in Gamma radiation in the States last week, September 22, 2018, to September 29, 2018, was 66,954,022 CPM YTD. This is lower than last week likely because of reduced use of nuke reactors in the States last week. This is still an increase in only a week that is way too high a price to pay in deaths and lost health; in addition to just being the Wrong thing to do. The Total Gamma Rad 2018 Annual Projection is just over 4.09 Billion Gamma Rad for the US. The Rad measured YTD in 2014 was 3,056,768,780 cpm. That is slightly Higher than 2018 YTD. Today’s 272-day or 6,528-hour report for January 1, 2018 to September 29, 2018, is another case of Bad news from your radWeather Report. 74.52% [to September 29] of 2018 is gone. 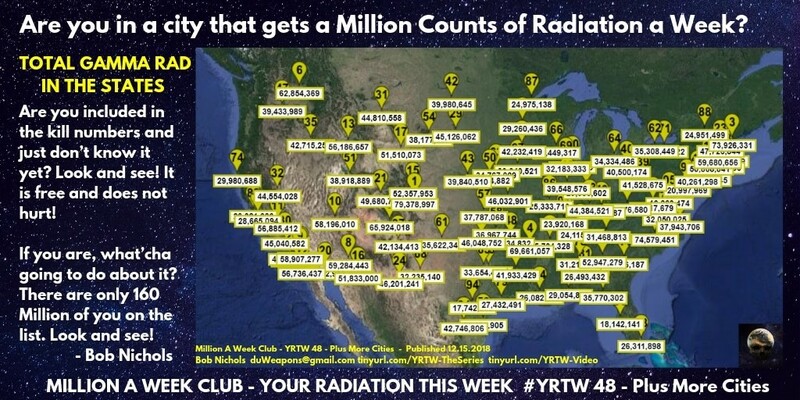 Within minutes or hours of publishing this list of cities over 38 Million YTD Counts of Radiation, four more cities will Zoom past 38 Million Counts of deadly Gamma Radiation since January 1, 2018. Cell assassins, like Plutonium 239, and its brothers were never around; they did not exist on this Planet. 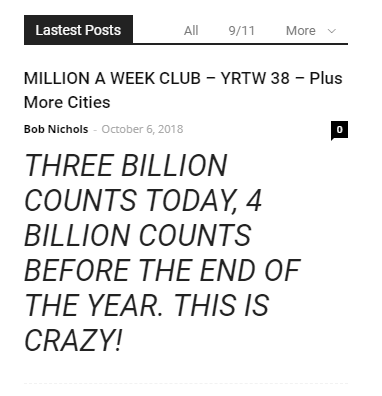 That will be 27 cities above 38 Million Rad Counts so far this year.